Source: Solidarity with Prisoners campaign page, Facebook. 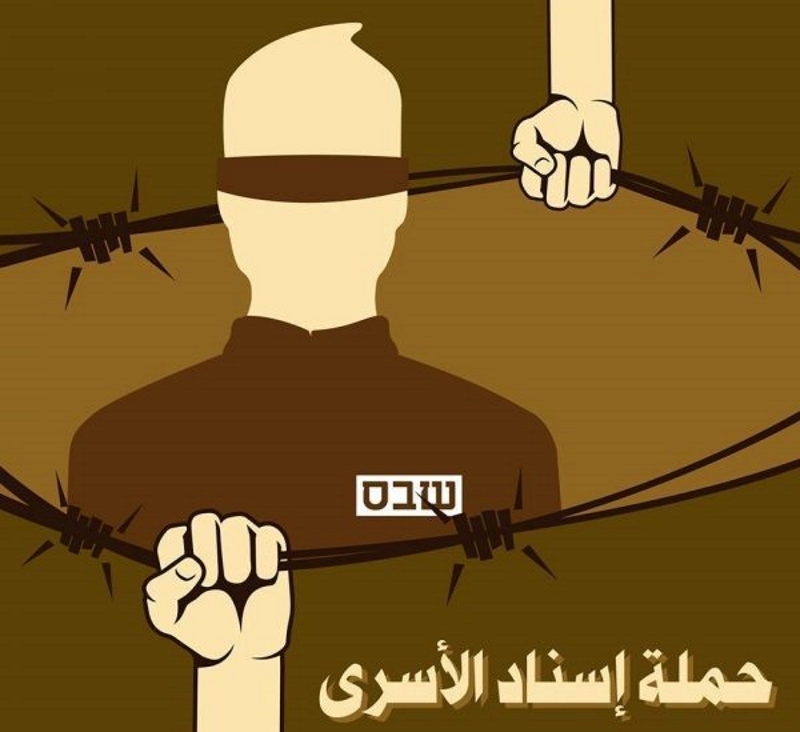 Every year on April 17, Palestinians, inside Palestine and in the diaspora, commemorate Palestinian Prisoners Day to draw attention to incarcerated Palestinians’ suffering and the abusive practices used against them inside Israeli prisons. This year, concurrently with the occasion, 1,500 out of 6,500 Palestinian prisoners went on a collective hunger strike, representing different Palestinian factions from Hadarim prison. That number would later rise to 1,580. Solidarity with the prisoners amongst Palestinian citizens has been taking various forms. From sit-in tents at centers of cities and villages throughout all Palestinian governorates, to launching campaigns on social media platforms and providing information and reports on prisoners, as well as public and official community marches and events. #DignityStrike has trended on all social media platforms, alongside invitations and posts calling for solidarity with the prisoners in various ways. One of these is the Salt Water Challenge, which is what the striking prisoners drink to stabilize their health, especially as the food strike progresses. Other ways include sharing support videos and posts and designing sketches and graphs reflecting the strike and its objectives, among others. In an attempt to simulate the prisoners ‘experience in the strike, a group of young Palestinian activists launched the Solidarity with Prisoners movement in which followers skip one meal or more every day, and then challenge another person to do the same and so on. It was launched on April 27, with a videotaped announcement from Mohammed Alyan, the father of Bahaa Alyan, the 23-year-old Palestinian community organizer, graphic designer, scout leader and political activist who was extrajudicially killed by Israeli police, saying he would go on a hunger strike for one day. Many Palestinian and Arab figures have also expressed their solidarity with the prisoners, including popular Lebanese singers Omaima al khalil and Ahmed Qa'bour (featured below), Karim Yunis, the longest-serving Palestinian prisoner in Israeli custody, and Lebanese poet and journalist Zahi Wahbi. – A public phone in every prison and stations so that prisoners can communicate with their families. – At least 18 satellite channels that meet prisoners’ needs. – Ventilation, cooling and heating systems. – Kitchens and bakeries to be restored in all prisons and put under the supervision of security prisoners, and prisoners to be allowed to buy groceries. – Restoring the two visits allowance. Currently the second visit has been stopped. – Regular visits every two weeks to be allowed and facilitated by all bodies, especially for Gaza prisoners. – First and second degree relatives to never be prevented from visiting the prisoner. – Visit time to be extended from 45 minutes to 90 minuets. – Allowing prisoners to take photos with their families every three months. – Providing facilities in front of prisons’ gates for visiting relatives to use and making sure they feel comfortable during the visit time. – Allowing children and grandchildren under 16 to visit. – Allowing visitors to bring books, newspapers, clothes, food and personal belongings to prisoners during visits. – Closure of the Ramle Prison Hospital for failing to provide prisoners with the required treatment. – Periodic medical examinations for prisoners. – Quick response to critical cases and timely surgeries performance. – Allowing specialized doctors from abroad. – Releasing prisoners with disabilities and chronic diseases. – Saving prisoners the cost of treatment. – Treating prisoners in a decent humane way during their transportation by buses. – Returning prisoners back to prisons from clinics and courts and not to keep them at the check points. – Arranging check points to be more humane and serving meals. – Responding to the needs and demands of Palestinian female prisoners in private transportation and direct contact with visitors during visiting hours, among others. – Continuing education at the Open Hebrew University to be allowed. – Allowing prisoners to sit middle school exams in an official and pre-arranged manner with the government. This post was edited and updated on May 4, 2017.